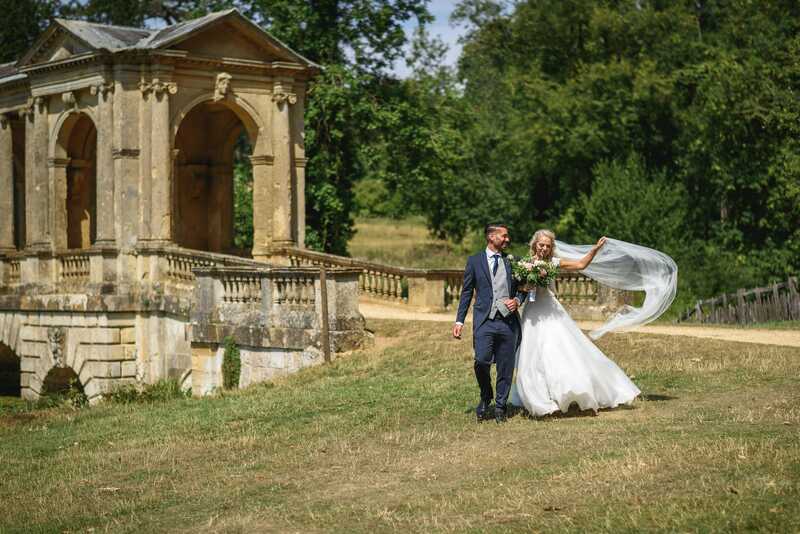 Hayley and Alex’s wedding took place earlier in the summer at the stunning Stowe House, Buckinghamshire, on a gorgeous and very hot July day. We are really excited about sharing details of this wedding with you – the attention to detail is second to none! It was such a pleasure to be part of Hayley’s wedding journey. Every time her and her family visited the boutique it was like catching up with friends and we are sad that those visits are now over. Hayley wore the classic ‘Cezanne’ by Suzanne Neville. A beautifully crafted lace bodice teamed with a full organza skirt. Hayley said ‘My dress was so comfortable to wear and that was really important to me as you’re wearing it for such a long time. The dress lent itself to the addition of a belt which complimented the dress perfectly and accentuated my figure. Choosing the ‘One’ is often the biggest decision to make when planning a wedding, and can for some be very tough. We asked Hayley how she knew ‘Cezanne’ was the one. Hayley chose to accessorize the dress with shoes and clutch bag by Rainbow Club @ John Lewis, bought for as a gift from her sister. She also added a beautiful lace sparkle belt by Suzanne Neville, which really accentuate her waist. To finish off her bridal look perfectly, as a wedding gift from Alex which Hayley opened the morning of, was a beautiful 9 carat white gold channel set diamond bangle from Atkinsons the Jeweller. As you can see Hayley looked ever inch the perfect bride, all elements of her look complemented her dress so well. 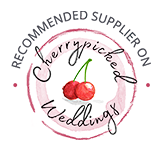 ‘Each of my friends who have married before me had visited The Bride and always recommend it for their high standard of customer service and such a personal experience. Now, I can say the same! Hayley wedding was centred around pure romance, and you can see this in the colours that she used to dress the venue. Here she explains her inspiration behind the day. My favourite moment was seeing Alex wearing his jacket with tails, stood at the top of the aisle. I was so nervous the morning of the wedding, I just wanted to see him to know that he was ok as I knew that he was nervous too. I walked down the aisle with my Dad while the string quartet were playing Kissing you by Des’ree. Once I was stood up next to him, I saw the huge flower urns created by Simon Nickell, each side of the window in front of us and I was totally blown away, they were towering over us. When I looked back at Alex, he had tears rolling down his cheeks and he lent in and whispered in my ear, “You look beautiful”. We loved every minute of our wedding breakfast provided by The Wild Fork. Our breakfast was set in the Marble Hall and the tablescapes provided by Duchess & Butler looked phenomenal. We went for five courses as we’re foodies and we wanted to it to be just that little bit more special. It was lovely to look around the room and see all your nearest and dearest in one room, all chatting and laughing and enjoying the day. Go with your instinct but be open to try other dresses. Dresses will look incredibly different on the peg and on other brides as compared to what they will look like on you. Enjoy the experience! As it was our first wedding dress appointment ever, we booked a lovely afternoon tea for after at Sopwell House and I’m so glad we did as we chatted for ages about all the details of the dresses I had just tried on.